The era of smartphones, tablets and laptop computers has brought on a silent but widespread plague of bad posture, which in turn leads to tense muscles and uneven weight gain around the waist. This week, The Korea Herald explored three new exercises that incorporate elements of dance to gain muscle tone while straightening the spine and facilitating proper breathing. Pilallet, a combination of Pilates and ballet, brings together the graceful posture of classical dance with the rehabilitative effects of Pilates. The workout is not a simple or easy one, as it entails delicate motions that require subtlety and acute attention to form. When carried out correctly and consistently, however, Pillalet can help strengthen, stretch and mold the finer muscles in your body, making for an elongated silhouette. The hybrid routine mixes basic balletic positions like demi-pointe, plie and developpe with the muscle-toning and stretching movements of Pilates, accompanied by calming piano music or mellow pop tunes. With each session lasting 55 minutes, the program is designed with careful consideration of the anatomy. Because of Pilallet’s effectiveness in correcting posture and toning -- but not buffing -- muscles, coach Yoon Seung-hye particularly recommends it for professional dancers and dance students. The 40-something Yoon, who has been dancing since the age of 10, said her joints had long been overworked due to strenuous training and, at one point, were nearly unable to function. Yoon had formerly majored in classical dance, but now gives lectures on Pilallet at universities. The method, formally known as AntiGravity Flying Yoga, involves using hanging hammocks to hold various poses or aid in particular movements. It has become the trendy workout of choice for many female Korean stars including Go Woo-ri, Hwang Shin-hye and Kang Ye-won. "The most basic move is called ‘inversion,’ and it‘s what gives flying yoga the benefits of antigravity," Kim said as she hooked her legs around the sides of the hammock to flip herself upside down. Inversion uses gravity to lengthen the spine, relieving pressure pressing spinal discs together throughout the day. Although it may be a bit intimidating at first, the key to staying balanced is to relax and hang limp. "The hammocks can support up to 500 kilograms," Kim emphasized. "As long as you don’t tense your muscles, separating yourself from the hammock, there‘s no way you will fall." In addition to inversions, the hammocks can be used to hold up various parts of the body in muscle-toning moves such as squats and back kicks, or held out to be used like a support bar. "Since the hammock is not as stable as an actual bar, it requires more strength and focus to stay balanced, giving you a more intense workout," Kim said. The hammock can also be used as extra support in leaning stretches, allowing you to hold poses that would be otherwise impossible. Flying yoga is recommended for those who wish to improve their posture, their blood circulation, and tone muscles without bulking up. Classes are 50 minutes each. With hanging leather straps, wire cables and churning handles, the Gyrotonic machine does not evoke images of fluidity and grace at first sight. "I know, it looks like a medieval torture machine," laughed master Michelle Lee at the Touch & Up Body Method studio in Mapo-gu, Seoul. 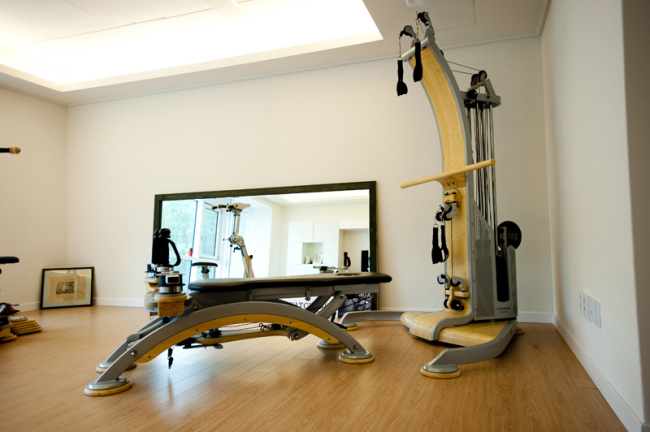 Despite its appearance, the Gyrotonic machine is not used for strenuous exercise. "None of the movements are linear," said Lee. "Everything is circular, and flowing. The point is to keep moving, without stopping. It doesn't feel that difficult, but you’ll find yourself sweating when the hour is up." The various handles and cables are used to stretch out the four limbs of the body in smooth dance-like movements that are paired with carefully controlled breathing to expand the rib cage and relieve pressure on various organs, while strengthening the core. The Gyrotonic Expansion System originally began with the nickname ”Yoga for Dancers,“ because the workout helps to correct posture and to create the optimal lean body for dancers. Since then, the system has evolved to be customized for people whose bodies are accustomed to different kinds of exercise, such as golfers and other athletes. "Since the movements are fluid, they can be effective even if they're not big," Lee said. "Gyrotonic is a great workout for everyone, no matter how athletic or unathletic you are." She says that Gyrotonic is particularly effective for people who want to become more flexible without injuring themselves by straining too hard. "At first, it’s important to start out with one-on-one classes because the instructor can tell you how far you can stretch without hurting yourself. Once you get the hang of it, you can start doing duets or group exercises to make it more interesting." Gyrotonic is recommended for those who wish to gain flexibility and a lean frame, and those who find it difficult to execute exercises without the help of supporting equipment. 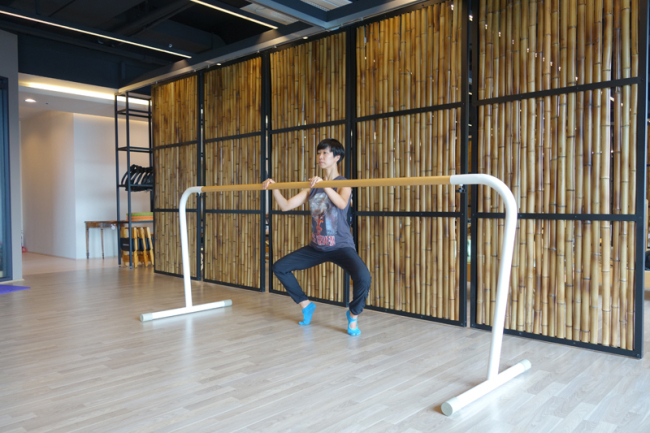 This is the second in a series of articles on new fitness and diet trends in Korea. -- Ed.